For years, my dad and mom had a couple of friends that, on a random afternoon, would drive up and say, “Y’all want to go to Buckner’s?” And off they went – to Jackson (about an hour south of the Atlanta airport), for fried chicken that has been served up, along side I-75, for almost 40 years. 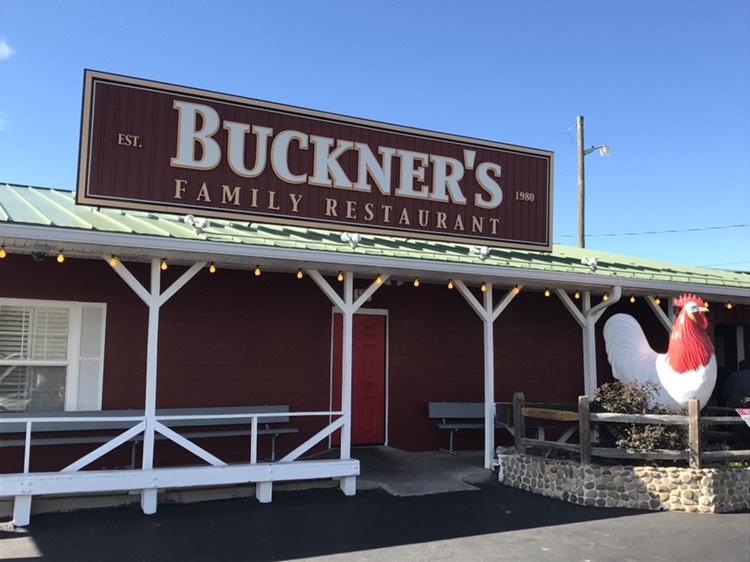 Open since 1980, the Buckners are now in their third generation – and serving the same Southern recipes as always. They are open Thursday through Sunday, eleven am to seven, eight or nine pm, depending on the day. Busiest times are Sunday afternoons and Friday and Saturday nights. Check their website for the somewhat complicated all you can eat pricing, which varies by time and day of the week. For what it’s worth, I’m fairly certain that mom and Dad always went on Thursday, for lunch, when the price was best – $11.50. It’s a family style (and not just your family – you’re sitting at a table of up to ten, with whoever comes in at the same time that you do), lazy Susan kind of place. 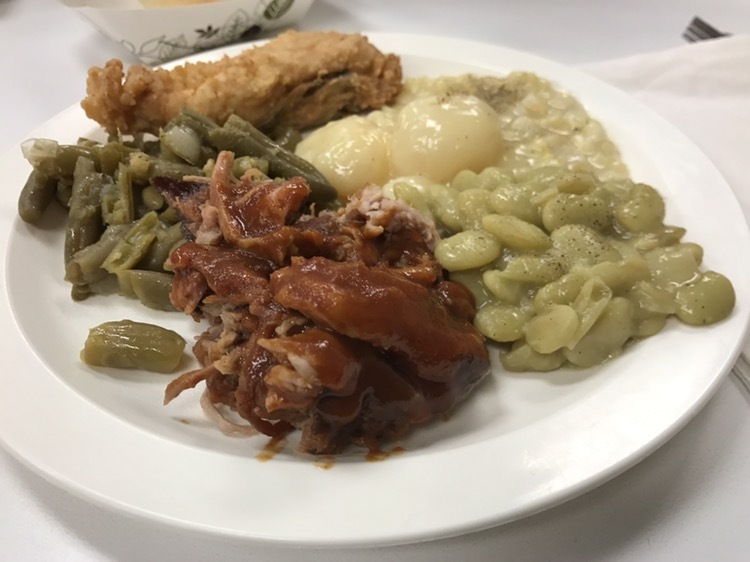 You can see the assortment of food in the picture above: fried chicken (which they’re known for), BBQ pork, stewed tomatoes, boiled potatoes, cream style corn, lima beans, green beans, cole slaw, rolls and corn bread and peach cobbler. It’s definitely home style cooking, particularly if your home was in the Southern suburbs of the 60s and 70s. I leaned heavily on the sides I grew up loving – boiled potatoes, green beans and lima beans. All we were missing were fresh sliced tomatoes, but they were out of season. The fried chicken deserves its reputation – it’s good. Both light and flaky, don’t make a mistake and fill up on other stuff and fail to get a second piece. One thing about the restaurant: as it’s been open for a while, it is showing its age. Our table was by an outside wall and the Lazy Susan listed toward the wall, where the floor dropped a couple of inches.